Once you are promoted to the position of company officer, the knowledge and skills required are not automatically granted to you. 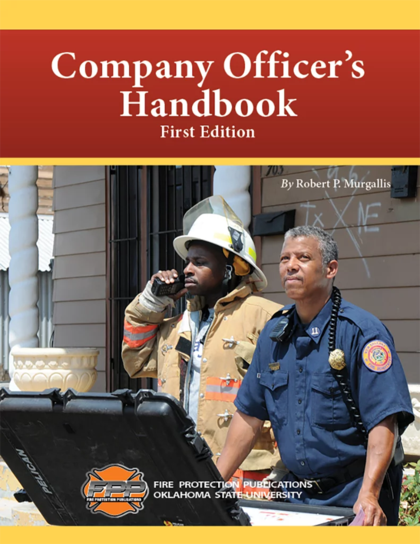 This Company Officer’s Handbook is based on the author’s own experiences as a new company officer as well as his extensive experience supervising new company officers. The knowledge he has assembled in this book is what he and others needed to transition into being an effective company officer. This book expands the knowledge base for entry level officers beyond emergency response. Find leadership, decision making, communications, conflict resolution, personal accountability, critical incident stress debriefing, time management, the responsibility for firefighter safety, as well as incident command, NIMS, fire protection systems, building construction, terrorism, and wildland urban interface fire fighting. The thirteen chapters are accompanied by a glossary, a list of training references and an index to make finding individual topics quick and easy. The author has prepared this handbook to assist company officers who are beginning their careers with need to know information in one book. He also prepared this book for all company officers who strive every day to be a better officer. Robert P. Murgallis is a second-generation firefighter with more than 40 years of experience. He retired as a Deputy Chief from the City of Santa Clara, California and continued his work for the United States Fire Administration as the Program Manager for the Command and Control curriculum at the National Fire Academy. He is a graduate of the Executive Fire Officer’s Program, and holds an AA Degree in Fire Science and a BS degree in Public Administration. He is a fire service instructor and has served as an adjunct faculty member and course developer for the National Fire Academy. He has also conducted international consulting and training. Chief Murgallis is a presenter at fire service conferences on such topics as training, management, and emergency operations. In addition to this book, Chief Murgallis has written numerous articles for trade publications and authored two other books published by Fire Protection Publications.